Over ten years ago, I started working on the book, pfSense: The Definitive Guide, with one author. A year later, we brought on the second author and we completed the book. It was a great success and reached the Amazon #7 ranking for all book genres — ranked higher than various New York Times and Oprah book club best sellers. Over the next few years, we worked on a second edition. I managed lots of book feedback and integrated suggestions and improvements. The authors and I collaborated using my Subversion repo and a lot of new content was written and edited for newer versions of pfSense. While I wanted to print the new book and many in the community frequently asked me for it, it didn't happen. So I wrote a new book from scratch. I based it on the latest pfSense versions and carefully outlined my steps in utilizing the useful interfaces. I was especially detailed in my approach — I used the source code for the individual displays to understand the interfaces (for example some content is dynamic and is only displayed if certain conditions exist). Plus I studied the source code for the many low-level functions that used the configurations to generate other configurations and options for the many servers and tools driven by pfSense. I used the code first before reading the software interface's hints and local documentation. As part of this work I also took careful notes about the bugs, some minor and some significant, that I found in the code reading or from actual use of the system. My local bug list is here and the bugtrracker list for my bugs is here. I'd guess I have read more of the pfSense (and old M0n0wall) code than 99% of all its contributors. I also assume I have used more of the pfSense code than 99% of all its users. I consider myself as an open source server and BSD administration expert, a QA expert, and an expert in documenting software background and usage. I have over 19 years experience as a Unix, BSD, and Linux administrator. As a professional consultant, I provided years of services covering many of the features and servers and tools bundled with pfSense. As a professional instructor for BSD, Linux, and Unix systems, I taught or organized over 70 classes — ranging from short seminars to week-long and quarter-long classes — covering many of these same programs. I have contributed for years in the BSD community as a developer, presenter, project manager, and, as a side project, a BSD technology and culture historian. As a QA expert, I have provided hundreds of fixes and improvements for numerous open source software (including some software bundled with pfSense) — and I have commit access for some significant open source projects. Professionally, I help improve the quality for critical internet infrastructure software including some software bundled with pfSense. In the journalism field, I started and ran the BSD Today news and features online magazine, BSD newsletter, managed the PHP Builder website (the software that powers the pfSense interface), and was an editor for Linux Today. I have written articles related to this software for two decades. I have written, co-authored, edited, or published numerous books, guides, tutorials, and coursewares. I started my computer journalism career as a researcher and writer for the once-very-popular BugNet. Of course, I have a lot to learn. In writing this new book I consulted many manuals and other documentation. But to control my bias, I never recently read through my original Definitive Guide book nor my unpublished second edition (it has been a few years) and rarely used the documentation from the official website. This new book is a complete rewrite. I look forward to shipping the book in print at half the price of the previous book. 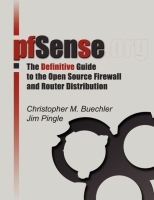 I look forward to helping the existing and future pfSense community via the book. Just like the old book, the new book covers the installation and basic configuration through advanced networking and firewalling. Just like the out-of-date book, the new book is designed to be a friendly step-by-step guide to common networking and security tasks, plus a thorough reference of pfSense's capabilities. Please share the news on twitter and other social media. Please like our publisher's page on facebook. or please follow me on Twitter.